I seem to be spending more and more time out in the East of London. Maybe Mark was right, the East is the center of all that is cool? Well, we know that I'm not just about cool (that made me chuckle a little) but it certainly has it's fair share of gastronomic landmarks. Although previous visits have seen me eat at markets, devour fantastic Bangladeshi grilled meat, play table football and drink the best coffee in London, I had yet to hit up Kingsland Road, also known as the Viet mile. 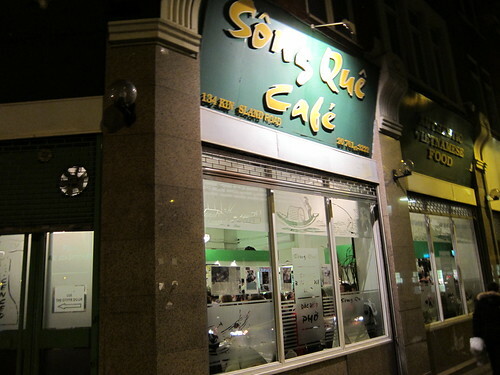 Last Friday saw me out East yet again when I went to watch some of the UK 2010 Barista of the year heats (absolutely fascinating by the way), and was the perfect opportunity to try out one of the more renowned restaurants on the Kingsland road, Song Que. After a rather lengthy wait, we were ushered to our table and with an iced Vietnamese coffee in tow, I started to make my way through the encyclopedic menu (it has over 150 listed items!). I got to about item 60 before my eyes started to get a little tired so I left it up to my dining companion to choose our dishes. First up was Bo La Lot (beef wrapped in betel leaves). 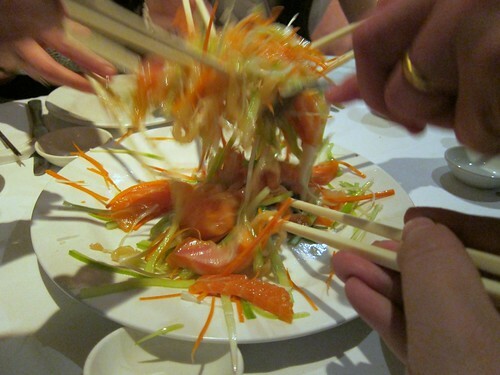 This dish requires some construction. First I was informed that I needed to take a single leaf of lettuce, line with noodles, herbs and pickled root veg (carrots and turnip, I think). 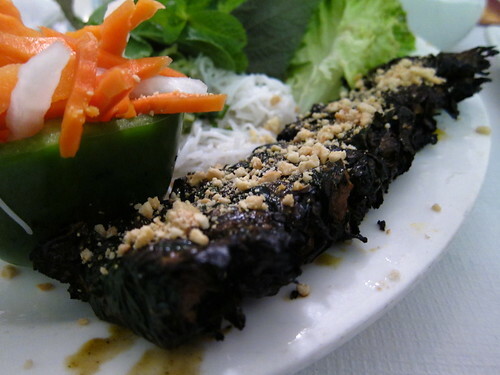 The beef is then dipped in fish sauce and wrapped in the filled leaf. The ensuing sensory onslaught is quite something. 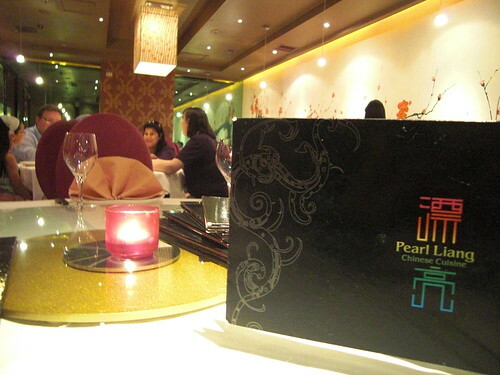 Sweet and sour from the pickled vegetables, aromatic smells and deeply savoury beef. The lettuce adds a clean finish to refresh your palate, ready for the next helping. 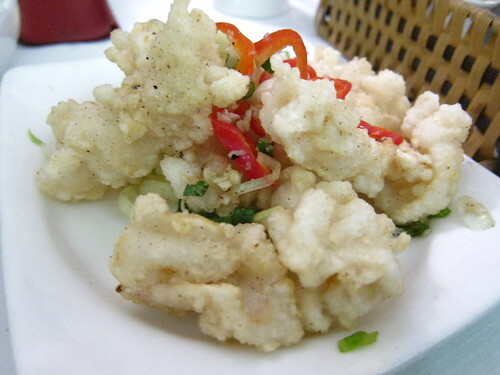 Man cannot live on beef alone, so the crispy chilli squid was ordered alongside. I have long lauded the baby chilli and garlic squid at Mandarin Kitchen, my favourite squid in London, and unfortunately this didn't quite match up. That having said, they were far from bad. 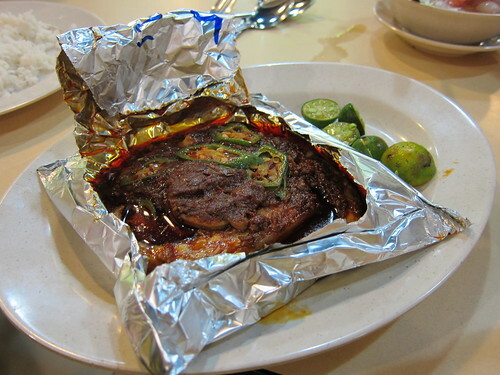 Although slightly on the salty side and a tad overcooked, still highly enjoyable and worth ordering. All these dishes were merely the precursor to the main event. I was assured that this was the best Pho (pronounced "fur", thanks to @hollowlegs for that lesson) on the Kingsland road. Unfortunately, the resulting dish was rather disappointing. 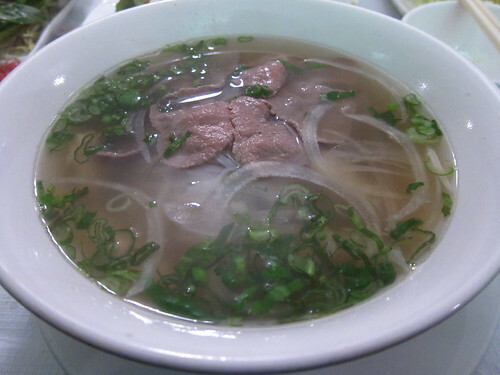 The essence of the pho comes from the intensely aromatic broth, steeped with flavour. 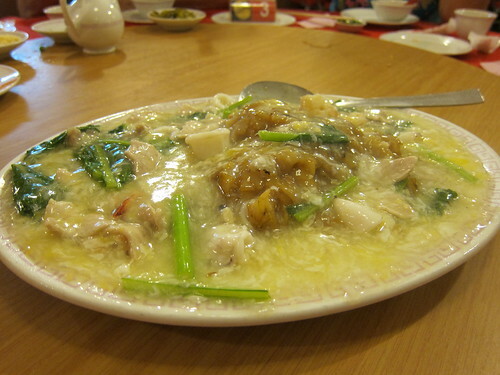 Although the slices of beef and chicken, as well as the rice noodles were perfectly adequate, the broth was one dimensional and had none of the punch required. 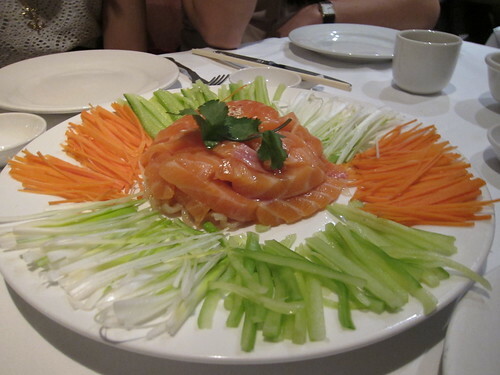 This probably had a lot to do with the time we were dining (9pm on a Friday night), but still disappointing nonetheless. I was assured that this was not par for the course and we proceeded to discuss what the best tactic would be to sample the best broth. I think we settled for around 2pm where the broth would have had time to develop its deeply complex flavours, whilst not having run out and risked being topped up with standard stock. Deeply scientific analysis. Although my visit was far from outstanding, the queues at the door tell me a different story. By the time we left (around 10pm) there were still lengthy queues, and considering that there are at least 10 other Vietnamese restaurants in the area, they must be doing something right. I certainly wouldn't rule out another visit, just maybe closer to 2pm next time. I can blog about what I want right? Inspired by Catty and her recent mini-posts, I just couldn't resist. Last night, I experienced true revelation. 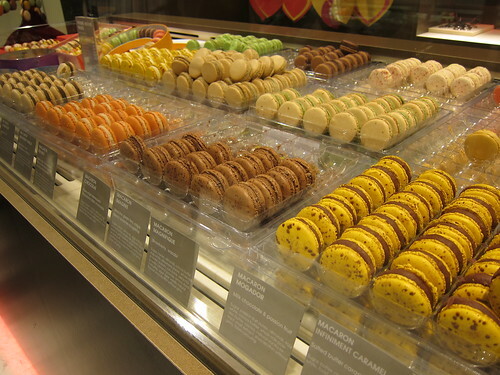 Pierre Herme is famous for his macarons and as of the 5th of February, has had a small outpost next to the cupcakes and breads in the Selfridges food hall. I am not really sure what it is about them, but after my first bite, I was genuinely lost for words. 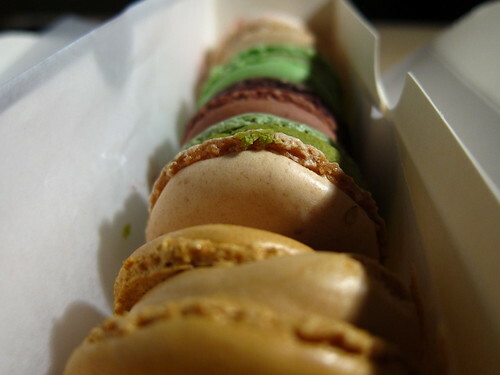 The light crisp shell gives way to a smooth, delicate cream filling, infused with a variety of flavours. Having devoured both a pistachio and salted caramel, I think I may have found a new direction for my life, to sample one of each and every flavour. I'm probably going to have to take out a loan to achieve this (it cost me £11 for 7) but an endeavour I genuinely believe is worth pursuing. 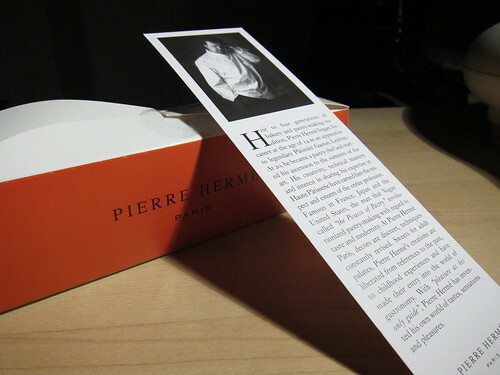 Word on the street is that a Pierre Herme shop will be opening in Knightsbridge in Spring. I genuinely cannot wait. 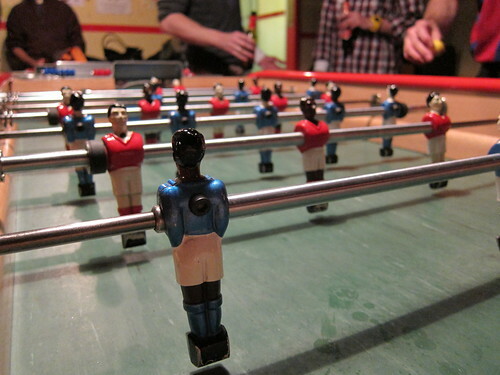 I love table football. Having worked in "meejia" for as long as I can remember, there was always a table knocking around, the perfect stress release from those hours of pointless meetings so many of us seem to endure. I don't think there is anything more satisfying than thwacking that plastic ball as hard as you can and the resonating *ping* as it it sails past the helpless goalkeeper and notches you another point on the abacus scoreboard. I digress, those were happy times, unfortunately all I have for recreation at work now are a few stress balls and the remnants of my Lego advent calender. Surprisingly, outside "meejia" games rooms, foosball tables are few and far between with Bar Kick a well received exception to the rule. Located at the top end of Shoreditch high street, the spacious bar is split onto two floors with a total of 10 Bonzini tables available. The Cafe Kick website says that the venue is "perfect for private tournaments" and was the venue for #GeekFoosball, a great event organised by @cyberdees. 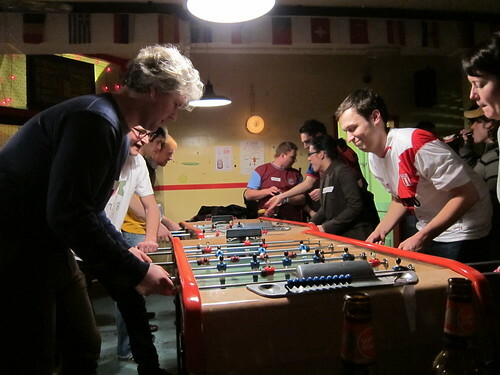 Bringing the London "geek" community and table football together, I was gutted to be knocked out by the eventual finalists but had a great time. Please check out the great video diary by Techfluff.tv. If you fancy joining in, the next Geek event is geek bowling on the 23rd March. 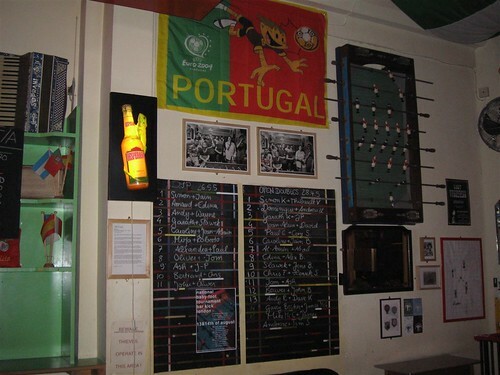 Table football aside, Bar Kick is a great bar. Serving a variety of beers from around the world including Windhoek from Namibia and Cusquena from Peru (including a rather sweet tequila based beer called Desperado), it's a great place to kick back, and enjoy a few beverages with friends. After I was knocked out from the competition, that was exactly what I did and after a long enjoyable night, stumbled my way home from East to South. I avoided the inevitable "babbage" as I had kindly been sent some goodies to try from Unearthed and knew I had them waiting for me at home. 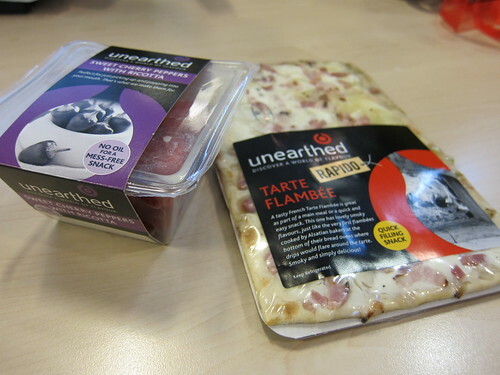 I had been sent a few new items from their snacking range and tucked into the sweet cherry peppers with ricotta whilst the tarte flambee was flung impatiently into the oven. Whilst I waited the seemingly endless 6 minutes (everything seems endless at that time of night) for the tarte to cook, I carried ploughing into the peppers. Being totally honest, I don't think the peppers filled with cheese was necessarily the ideal snack after a few shandies, and appreciated the sweet and slightly spicy peppers a little more in the morning. 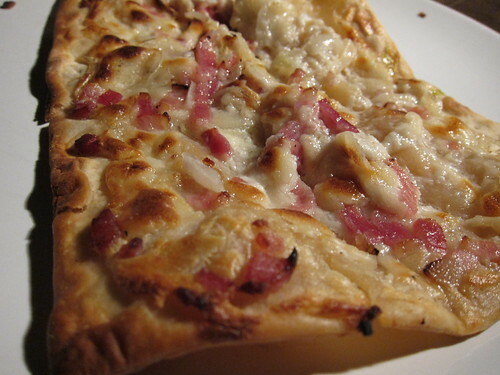 The tarte flambee, on the other hand, was perfect post-pub snacking material. Smothered with cheese, onions and bacon, it was an excellent antidote for a very hungry and slightly inebriated chinaman. Check out the rest of their range here. 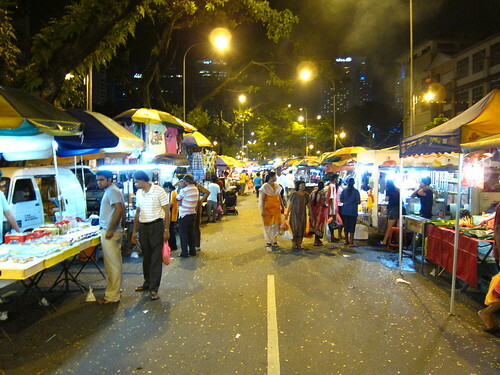 Brickfields Night Market/"Pasar Malam" - One of the things I had on my list of things to do was visit a pasar malam. 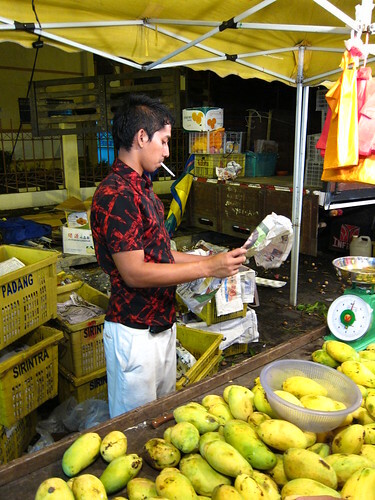 These markets are spread across the city and can be found at different destinations on different days. Some are larger than others and focus around selling clothes and food, but most appeared to be focused towards the locals as opposed to tourists. My family were quite reluctant to go as they can get ridiculously busy and parking is an absolute nightmare. 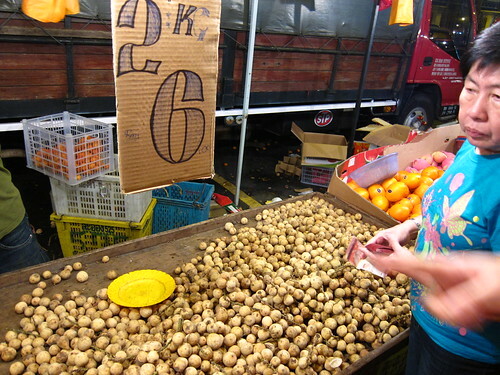 However, we did head to the end of a local pasar malam in Brickfields to pick up some fruit. 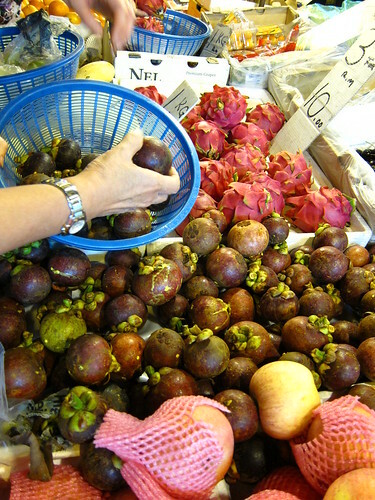 In my whole trip, I must have tried about 5 different varieties of fruit that I had never tried before. These include dokong and chiku. Kuala Lumpur in the smog - KL is an ever expanding metropolis and wherever you look, you are bound to spot a crane or another new building reaching for the sky. With all this work comes large amounts of pollution. 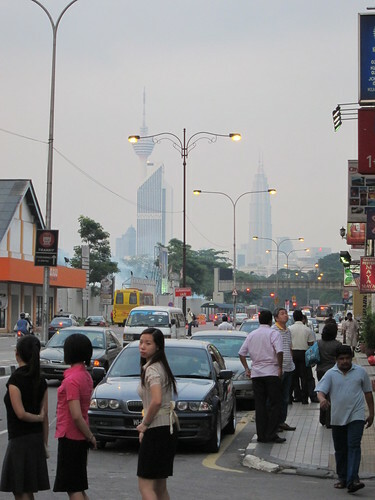 In this picture, you can just about make out the Petronas Towers and KL towers in the distance. 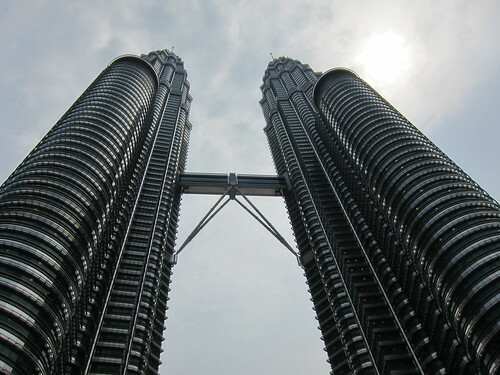 Petronas Twin Towers - The worlds tallest building until 2004, this structure towers over the rest of Kuala Lumpur. I managed to head up to the SkyBridge which links the 41st floors of the towers and offers a pretty great view over Kuala Lumpur. Although free, the tickets are very popular and are only handed out for the day so get there early to avoid disappointment. 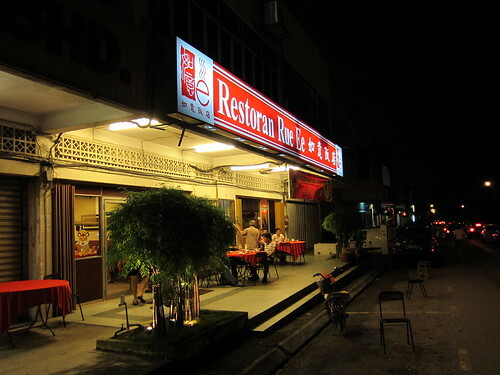 Restaurant Rue Ee - A Chinese restaurant located in OUG (Overseas Union Gardens) and a particular favourite of my family. 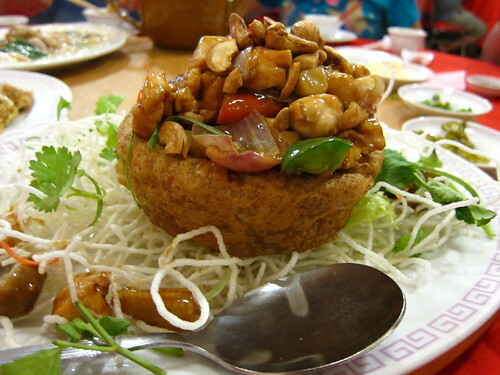 It's two specialities are its fried hor fun (flat rice noodles) and filled yam ring. 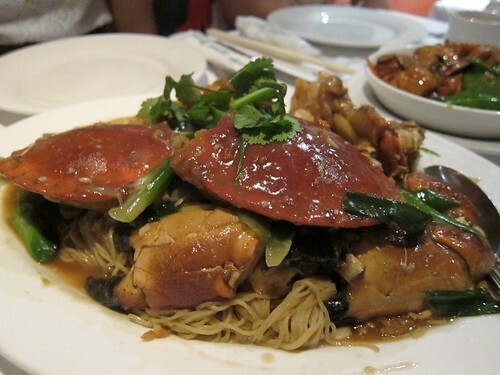 The hor fun is fried in a very hot wok to give the noodles a smoky flavour and is served in a viscous gravy packed with pork, squid and greens. The yam (or taro) ring has the texture of a very smooth and slightly sweet potato and is fried to retain its shape. 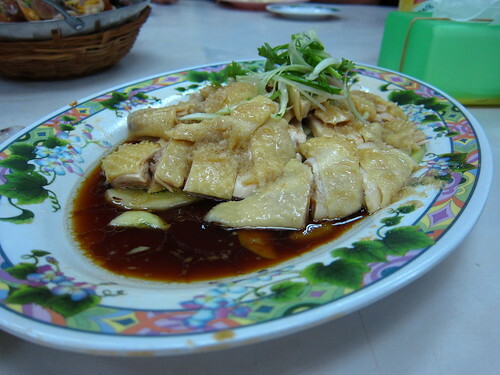 Filled with a simple stir fried chicken and vegetables, the yam is an excellent accompaniment. 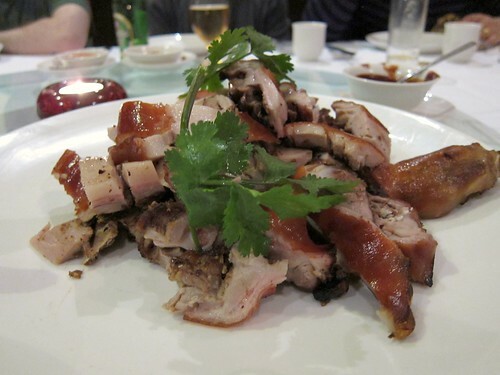 Both are excellent, and well worth a visit for these two dishes alone. Cendol - In such a hot country (it was averaging about 35C during my stay) it is essential that you stay hydrated and stay cool. 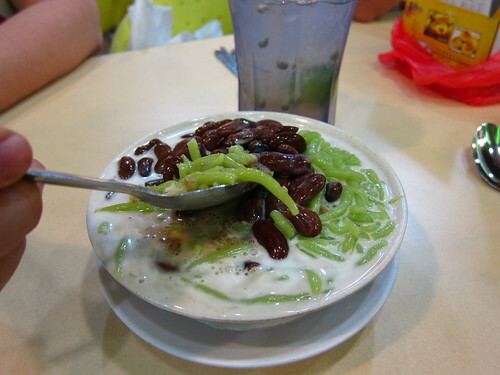 One of Malaysia's most common desserts helps you fulfill both these criteria. Essentially, it is shaved ice with a variety of possible toppings, normally comprising of red beans, coconut milk and grass jelly. 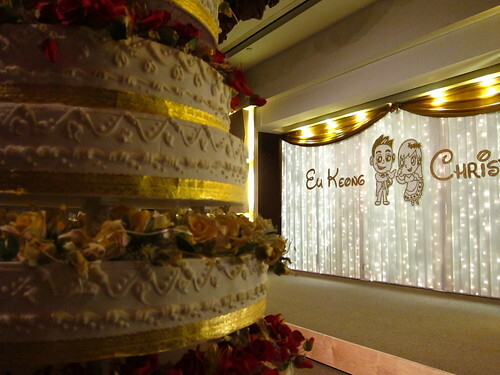 My cousins big fat Chinese wedding - The main event, and the main reason why I had flown to Malaysia. 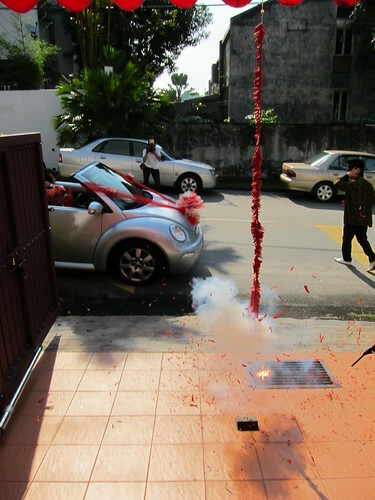 Now I wasn't really prepared for the shenanigans involved in a Chinese wedding. 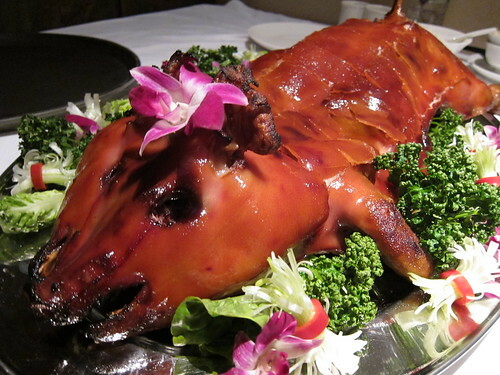 By the time I had landed, a whole pig had already been involved, as well as other fruit and meat related exploits. 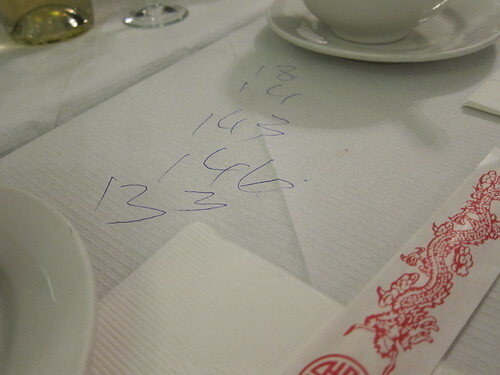 The Chinese really like their food. 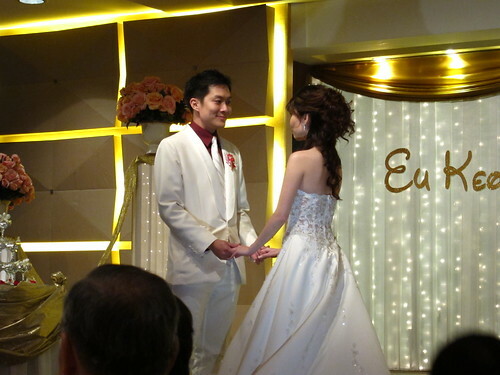 On the actual day of the wedding, a Takeshi Castle style mission was launched to "sieze" the bride. My cousin and his convoy of 14 friends headed for his brides house only to be faced with 19 of her cohorts and a variety of humiliating tasks. After enduring various embarrassing poses, eating dried scorpions and other strange tasks, he and his cohorts were successful in retrieving the bride. The next phase of the wedding, and arguably the most important part, is the tea ceremony. 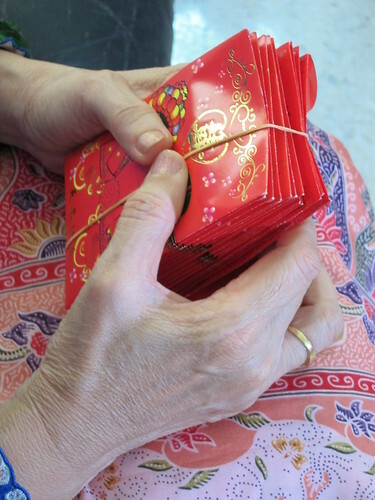 This practise involves older members giving red packets of money know as ang pow ( I am Hokkien, I guess some of you guys might recognise it as Hong Bao) to the married couple. In return, we are served a sweetened Chinese tea. 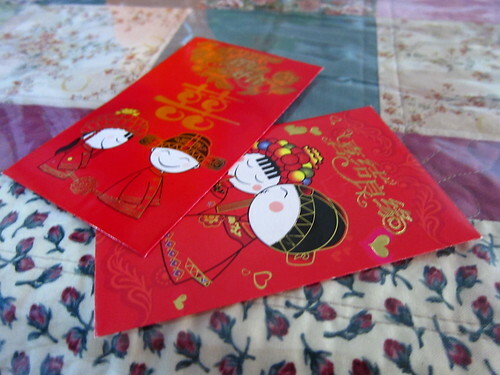 Younger members serve the tea and receive ang pow. Traditionally, its a good way for the bride to meet all the extended family (I must have gained at least 5 new aunties and uncles on this trip alone!). 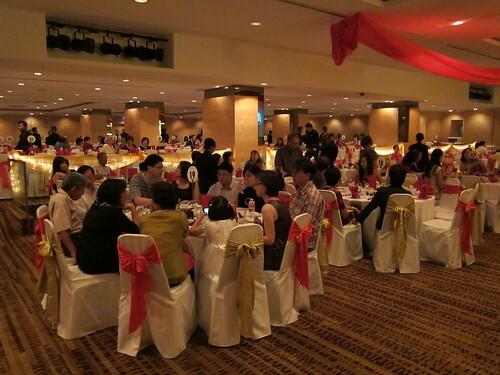 The final phase of the wedding is the dinner and when you consider that there were over 550 guests (those aunties and uncles again), it is one rather full on experience. Crazy wedding MC's, elaborate entries for food (the first course at a wedding always gets a theatrical entrance), more dress changes than you can shake a stick at (and not just from the bride) and cheering "Yam Seng" as loud and as long as possible. This is an experience that everyone should experience at least once in their life. There are so many other things to talk about and mention, but here are a few more pics of food, where I ate them and what they are. 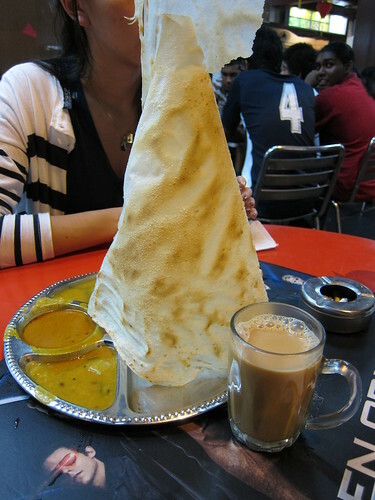 Kuala Lumpur is a fantastic city and I recommend a visit if you have never been. And you have my word, you will never go hungry! For the rest of my pics, you can find them here. Sunday has always been considered the day of rest. Even the big guy upstairs needed a break and Sunday was that day. However, for many of the stall holders located all over London, rest is far from their minds as they have to be up early to nab that great pitch and steel themselves for the baying crowds. 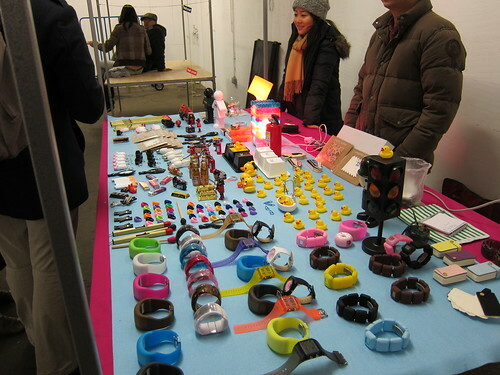 One of these people is Elaine, a work colleague of mine who moonlights as an online search specialist by day but chooses to sell gifts and gadgets at the Sunday Up market (located in the Truman Brewery), unsurprisngly on Sundays. I decided to go and visit her stall, and under her "Tobycat" brand (affectionately named after her cat...er...Toby), she sell an array of strange lamps, watches and lighters (amongst other things) to her adoring public. 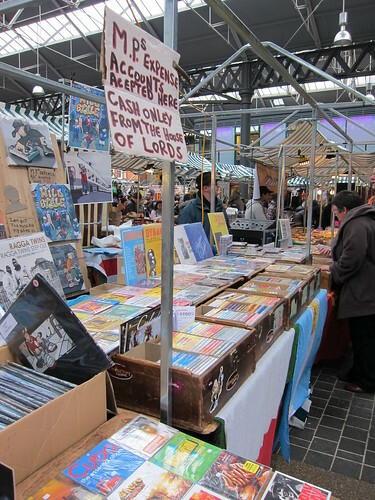 After wondering around the vast array of stalls, selling everything from clothes and art to tea (I bought some great green tea from Yumchaa) and gadgets, head to the back of the market where you will find food from across the globe. With stalls selling comestibles from all over the world, including Brazil, Sri Lanka and the standard Japanese and Indian stalls, you really can get a taste of almost anywhere. On this visit, I bought some pao de queijo (or Brazilian cheese balls) and a bánh mì from the lovely Aussie girls at Mon Me (sorry for the awful pic!). In my eyes, Sunday Up still remains true to many traditional market values. 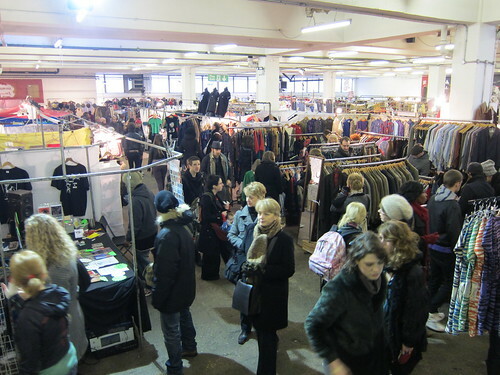 There are a smorgasbord of stalls run by members of the public, open to haggle and eager to sell, all for a modest amount of rent. 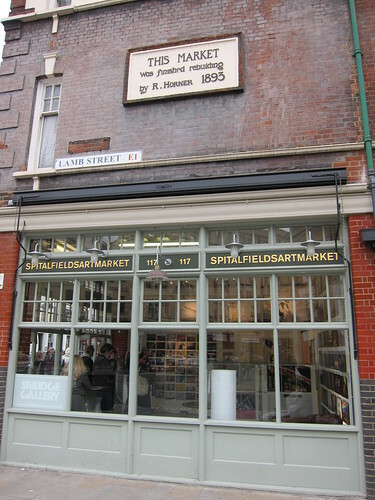 Spitalfields Market used to be like this but after a (relatively) recent redevelopment, seems to have lost much of its original charm for me. Some of the traditional stalls remain, but the seemingly smaller space is flanked by an array of chain restaurants and more established retailers. 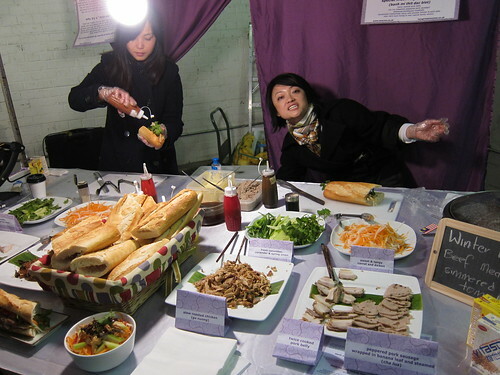 In addition, the food stalls lack the ruggedness and variety of Sunday Up with dedicated units built into the walls with the sole purpose of providing food. They even have running water! 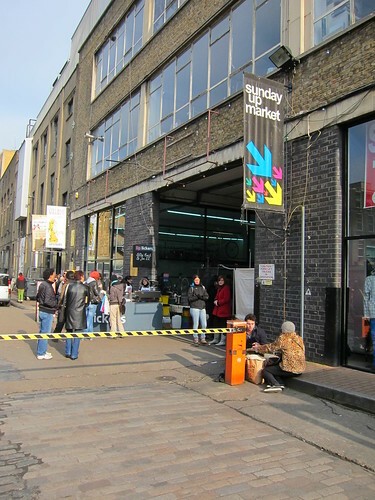 It's still a decent market, but if you want character, head across the road and have a wander through Sunday Up. 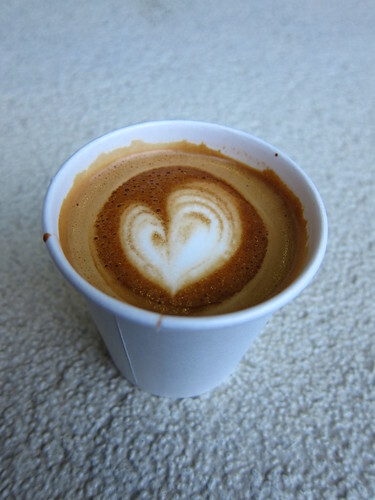 After all that hustle and bustle, it was time to take it easy and get some caffeine in me. Prufrock Coffee is a small coffee concession in a shop selling clothes (Present on Shoreditch High Street) and a mere stroll from Sunday Up and Spitalfields. A strange combination, but when coffee is this enjoyable, it doesn't really matter where it is made. 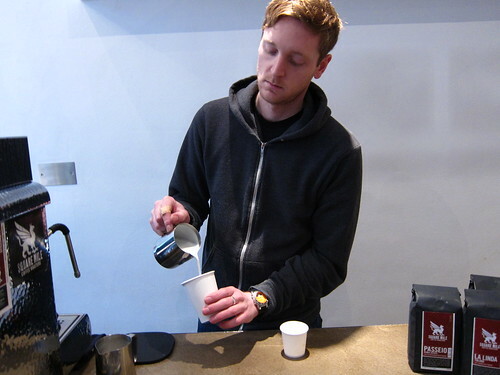 Serving Square Mile coffee, it is the brainchild of Gwilym Davies (reigning world barista champion). Smooth and nutty with a strange slightly sweet finish, this is really high grade coffee and the perfect pick me up after a hard day at the markets.